If you’ve been exploring the world of yoga and meditation, there’s a high possibility that you’ve encountered the term ‘transcendental meditation’ at least once or twice during your research. 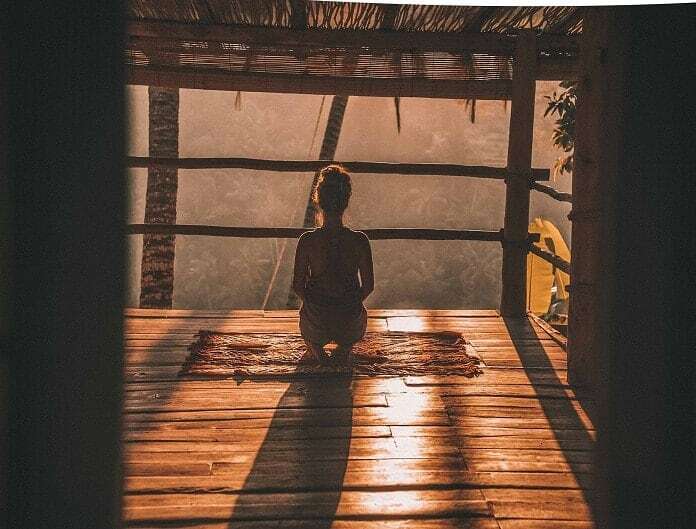 This type of meditation is said to be very effective and its benefits are numerous, making it a hot topic within the yogi community within recent years. It has even caught the attention of celebrities and famous personalities like Pink, Oprah Winfrey, and David Lynch to name a few. And so, it’s not a surprise to come by this word once in a while, especially on the internet. Whether you’ve done your research and would like to know more about it, or if this is your first time ever hearing the term transcendental meditation, you’ve come to the right place. This article covers everything you need to know about transcendental meditation: what it really is and what one can expect from it. And you will learn how to do transcendental meditation step by step at the end. Although transcendental meditation has become quite popular recently, not a lot of people know exactly what it is. Many still wonder what it’s about while tirelessly searching the internet on how to do transcendental meditation. For something quite popular, one would expect to have access to more information that’s freely available on the internet. A quick Google search will tell you that transcendental meditation is actually a trademarked meditation technique. More commonly known as The TM Technique, this form of meditation is advertised as the simplest way to gain inner peace and clarity. It requires no concentration, no controlling or emptying of the mind – basically a stark difference from the type of meditation we have all come to know. Instead of controlling your thoughts and harnessing the power of mindfulness, transcendental meditation utilizes sound or a mantra in order to practice meditation. It is a specialized technique which can only be learned through the guidance of a TM Technique-certified practitioner. Because of this, the exact process used in the program is not publicly released. The TM Technique also relies heavily on the feedback of its current practitioners, most of them are celebrities and famous personalities. Because of the very nature of The TM Technique, many of people, especially those within the yoga community, are wondering if it is actually reliable and worth trying out. After all, everything about it is the exact opposite of more traditional forms of meditation. If you’ve been wanting to give transcendental meditation a try but are holding back because of its seemingly suspicious background, it’s time to put your doubts to rest. Read on to find out more about the origins of transcendental meditation. Transcendental Meditation was introduced in India during the mid-1950’s by the Indian guru, Maharishi Mahesh Yogi. However, this is not to say that he is the founder of transcendental meditation; history states that it actually dates back to India’s Vedic traditions. It was Maharishi, however, who notably spearheaded the expansion of its concepts and rituals throughout India and later on, to the whole world. He started teaching his transcendental meditation technique in religious and spiritual terms. Maharishi held tours all across India, teaching others about transcendental meditation. But it wasn’t until a shift towards more technical goals that he was able to spread his TM Technique to a wider crowd. After successfully introducing transcendental meditation to popular figures, he then created a non-profit organization aimed at spreading the TM Technique to more people across the globe. Today, the TM Technique is being taught by members of said organization. We’ve been told that meditation practice is free and available for everyone to use, but is it the same for transcendental meditation? The good news is that anyone can start to learn the TM Technique. However, it should not be seen as a replacement or even as a requirement to traditional forms of meditation. This is not to say that transcendental meditation is just another fad – it does have tons of benefits for certain types of people. If you are in any situation listed below, perhaps this is a great opportunity for you to explore the world of transcendental meditation. The TM Technique is said to be an effortless method of meditation. Traditional forms of meditation require the practitioner to concentrate on a single object during a session. This can be very difficult for someone who is easily distracted or for someone who can hold their focus on one single object for long periods of time. Of course, this does not mean that meditation is not an option. Through transcendental meditation, people who have difficulties concentrating may be able to reap the benefits of a regular meditation practice without extra effort. Although this may sound lazy to a lot of people, it is actually a method of making the benefits of meditation accessible to anyone and everyone. No one has ever said that you need to suffer in order to master meditation. So, if you have been struggling with concentrating, give the TM Technique a try; it might give you the help you need in order for you to finally see results. Another pressing problem of most meditation practitioners is not being able to empty the mind. There are just some thoughts that cannot leave us alone. It is totally understandable if you are having difficulties emptying the mind. It’s either because they have impacted us greatly or we have a deep connection with such thoughts – both causes should not be taken lightly by others. If you’re one of those people who just can’t seem to take their mind off certain thoughts, transcendental meditation does not require an empty slate for you to practice meditation. Let’s face it – when we are stressed or preoccupied with more pressing issues in our lives, it is almost impossible to take notice of every detail occurring at a given moment. When we are stressed, our minds dive into panic mode and everything else seems like a blue. During these moments, we are advised to be mindful of our surroundings. But we all know that this is easier said than done – not everyone can take notice of every detail around them. The great thing about the TM Technique is that it also doesn’t require you to practice mindfulness. If you’re curious about how this all works, you might want to give it a try. Last but definitely not the least, the TM Technique is recommended for those who are struggling with inconsistency with their practice. All of us have some days when we just don’t want to do anything – much less have the mind and energy to meditate. One of the reasons you may be inconsistent with your meditation practice is that it has become more of a chore than something which you actually enjoy. You may be pushing yourself so hard that it has become difficult enough for you to stay away from your practice. Why not try something a bit easier in order to get into the habit of meditating first? Although challenging yourself is definitely a good thing, you should still be able to at least manage and be consistent with your practice. Now that you know that certain types of people can benefit from transcendental meditation, you might be considering giving it a try. But what if you have no qualms about your current meditation practice, are there any other reasons why you should try out the TM Technique? There are two main reasons that can drastically affect the quality of your meditation practice. Whether you are a beginner or a veteran at meditating, inconsistency and complacency can definitely influence the success of your practice. When meditation becomes too difficult, many people tend to give in to the temptation of giving up. On the other hand, when one becomes too satisfied and comfortable with their current progress, they may not find the need to challenge themselves any further. This stops them from growing into their practice, leading them to miss out on the other advantages of meditation. All of us face problems during our meditation journey but what truly matters is our will to keep moving forward. Being inconsistent and too complacent leaves us stuck and unable to move forward. Transcendental meditation, however, can help us get over our slump because of how effortless and easy it claims to be. When a roadblock is presented to us, why not take advantage of the available resources to help us get through? It wouldn’t hurt to give it a shot. Maybe inconsistency or complacency isn’t your problem. Perhaps you’re new to meditation and have yet to discover its acclaimed benefits. Starting out is always the most difficult part, especially if you aren’t used to the concepts being presented in traditional meditation. The sad truth is that a lot of us expect results to show fast. And if we don’t see them quickly enough, most of us also tend to give up very easily. Although the idea of transcendental meditation may sound like a shortcut compared to its more traditional counterpart, perhaps all it takes is a taste of success for you to start putting in more effort. After all, we wouldn’t have a clue as to how good something really is until we have experienced it for ourselves. Once we realize what we’re missing out on, maybe it will push us to work harder and to instill some discipline into our meditation practice. Trying too hard to concentrate or to control your thoughts may actually be contradicting to what meditation practice teaches. Instead of learning how to let go, we become too bothered by executing the practice perfectly. We then end up focusing on the wrong things rather than achieving that inner peace and calmness we were searching for in the first place. Nobody ever said that meditation was going to be easy for everyone. And no one has ever said that you need to suffer in order to meditate. If your struggles keep you away from participating in your meditation session, perhaps you need to try other methods. And since transcendental meditation is often advertised as an effortless way to meditate, why not give it a try and see how it works for you? The number one question among those who are interested in the TM Technique is how does one actually do the practice? Perhaps you’ve been searching far and wide on the internet for articles on how to do transcendental meditation. The good news is, you have found this article. As we mentioned before, the TM Technique is a trademarked practice and therefore, the exact method being used cannot be divulged to the public. Learning the TM Technique also requires you to be under the tutelage of a certified practitioner. Step 1. Look for a peaceful environment in which you can perform your meditation practice. Step 2. You may choose to sit on a chair or on the floor ,but the most important part is to find a comfortable position for yourself. You may be sitting in the same spot for quite a while. So, you need to make sure that you are in a position that’s cozy enough for at least 30 minutes. Step 3. To begin, simply close your eyes and breathe deeply. You may want to incorporate some breathing exercises as well during your session. Step 4. Allow your body to relax; release any tension you may be feeling at the moment. Step 5. Repeat your chosen mantra or Sanskrit sound. Transcendental meditation teachers would usually provide their students with a Sanskrit sound but if you’re doing this on your own, you may want to make a quick search on some sounds or mantras beforehand. Step 6. When you feel yourself getting distracted, simply repeat your mantra or Sanskrit sound again to get back into your meditation. Step 7. After 20 minutes or so, you may want to ease back into your surroundings by moving your toes and fingers for a while. Step 8. When you are ready, open your eyes slowly and you are done with your session. Transcendental meditation is said to be the easiest and most effortless method of meditation. If you’ve been wanting to get into meditation but have been struggling with a couple of issues, remember to give this a try. This article contains almost all you need to know about TM and how to do transcendental meditation step by step. However, it is also important to remember not to become too comfortable with a certain method of meditation. Challenge yourself to level-up regularly and you will be well on your way to achieving meditation success.